Formalizing your lead generation process is the key to success with your business website. To do so, you must become aware of the structure of your sales funnel and streamline it to help increase your conversion rate (CR). 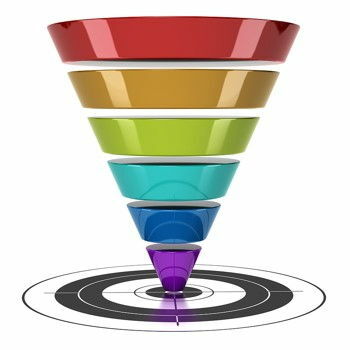 To review, the sales funnel generally stands for the marketing steps, and interactions, that take place on the part of you and your website visitors (potential customers) before people take a desired action such as purchasing your products or services, signing up for a mailing list or subscribing. To streamline your sales funnel, you must become aware of which customers are likely to partake in your offerings and separate, or filter them out, from those who are not interested or qualified to purchase. It is assumed in the e-commerce world that particular segments of the online market have particular needs that separate them from other market segments. Once you have categorized your leads into segments or groupings, you can pinpoint the needs of the individuals in each group and use that understanding to guide the benefits you present through your sales copy on your landing pages, website content and the ads you run. Showing those who have a particular need that your product or service is extremely likely to meet is crucial to increase your conversion rate. A need can be summed up as a problem that needs solving. Your duty, under that mindset, is to readily demonstrate that what you offer will solve a particular problem. It is very possible that your product or service is capable of meeting two or more needs. Set up multiple distinct landing pages that each focus on various market segments’ particular needs/problems/vantage points. Test many ads for effectiveness, each touting your ability to meet one need within each market segment. There are three types of sales leads: cold, warm and hot. By distinguishing your leads using these three categories, you can devise unique strategies to convert each type. Many times those strategies involve presenting frequently asked questions, concerns or doubts accompanied by answers that clarify and resolve those issues. A FAQ section of your website is an excellent idea, to that end, even if you think your benefits are self-evident. Cold leads are those who have never heard of your company or its products and services. They are the least likely to make a purchase. Warm leads are those who demonstrate a mild interest but are not ready to buy – or those who actually are ready to buy but do not have the authority to do so (example: an individual who does not hold the proverbial checkbook). Hot leads are those who are ready to buy, and you simply need to execute turnkey solutions to lead them across the threshold. Relying solely on the heart of your niche and your hottest leads within it would be a grave oversight on the part of any webmaster. You may not think so yet, but next you will see that you actually do have the ability to make warm up cold leads. Sometimes an individual who seems to be a cold lead, due to not appearing to have the need or problem that would cause them to need your product or service, may actually be persuadable. For instance, you may think it’s nearly impossible to get a man to buy beauty supplies, right? What if you set up a landing page about how much women love to receive a gift certificate or gift card as an anniversary, birthday or holiday gift? How about setting up a landing page for style-conscious men and how “in” that is in modern society. Congratulations, in doing so, you will have turned two cold leads, from two potentially different market segments, into hot leads in one easy step! You need to nurture your warm leads if you wish to take advantage of the possibility that they could become hot leads. How do you bring warm leads to their boiling point? One effective method is to inject a sense of urgency into your call to action. Remember that your warm leads have a finite budget and it is possible they want what you offer, but they simply want or need other things more and consider your offerings to be distant on their “things to buy” list. Run ad copy, landing pages and website content that persuades warm leads to buy now. Explain why putting it off to another time won’t do. Why do you think you hear “limited time offer” in so many commercials?